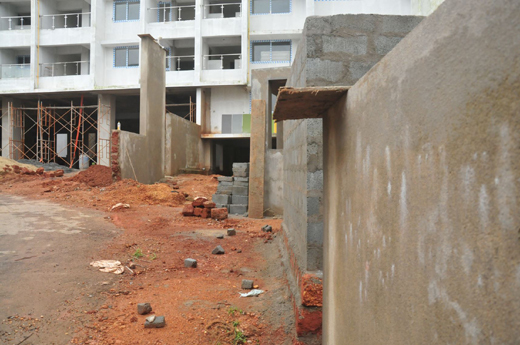 Mangalore, Sep 3, 2014: A few of the builders in Mangalore city has been building apartments and commercial complexes flouting all rules and regulations, sometimes starting construction even without the approval of the authorities. Selling free of FSI areas and illegal floors are common these days in Mangalore. There are a few who encroaches the public areas including the roads. 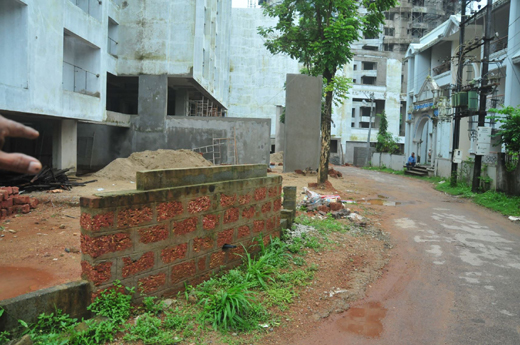 For instance, the builder of Plama Gardenia Apartment complex at Kaprigudda, Falnir has built a Gate keeper’s room right on the road and is building the compound wall five feet inside the road. 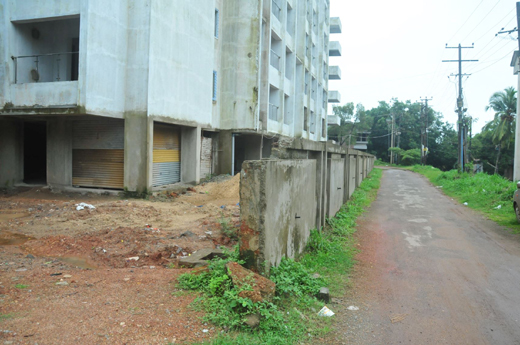 Residents and general public had objected to the construction of the compound wall on the road and informed MLA, J.R.Lobo and Corporater Raof. Mr. Lobo has asked the Town Planning officer to visit the site and stop the illegal construction on July 29, 2014. The Town Planning officer visited the site and confirmed the illegal construction. He stopped the construction and asked the builder to remove the constructed wall. He assured the public that he will not allow the builder to build the compound wall on the road. On August 25, 2014, the builder started construction of the wall on the road again. Builder goes ahead with construction against the TPO’s objection. Public protested the illegal construction. On September 3, Town Planing Officer, Balakrishna Gowda visited the location along with area Corporator Rauf and stopped the illegal construction again and marked line to construct the compound wall. He also warned the builder of dire consequences. Soon after the official and coporator left the site the builder resumed the construction against the order of the TPO. Further, the builder not only disobeyed Law of the land but also questioned the government and the public. 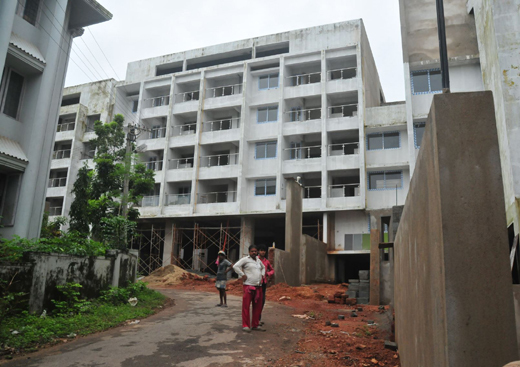 He even threatened the public who informed the officials of Mangalore City Corporation. The Plama Gardenia has flouted all building rules. 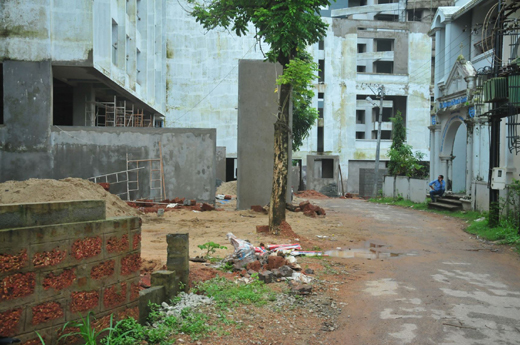 As per the rule, if the road width is 20 feet, the license for construction of apartment is given for 3 floors only. (Ground +3). Where as, Plama has built 4 floors above the ground floor in the Plama Gardenia Apartment. The approved plan of the building shows only 20 ft wide road. The building also shows blantant violation of Fire & Safty laws. There is no drainage connection facility in the area. 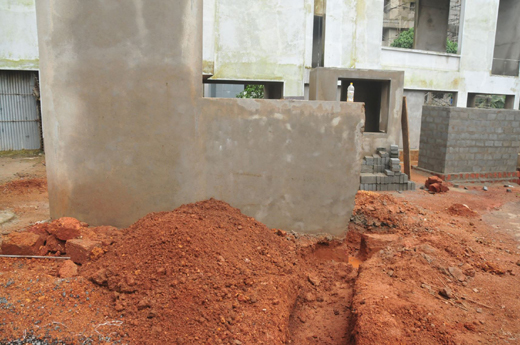 The blatant violation of building rules and regulations are not new to Mangalore City. However, encroaching roads and public properties are on the rise these days. The builder encroached 5 ft of the 25 ft wide road and took the MCC permission showing it 20 ft road when there is already 25 ft wide road for decades. Now, the question is, whom to approach if such is the high handedness of builders.